Iblis Phase 2 is both Shadow's second and Sonic's third boss in Sonic the Hedgehog (2006); it plays identically for each of the hedgehogs. Having been sent into the terrifying possible future that is Silver's home, Sonic, Tails, Knuckles, Shadow, and Rouge attempt to return to their own time via Chaos Control. Just as they find the final Chaos Emerald they need in the volcanic bowels of Flame Core, Iblis appears to prevent them abstracting the gem. In its second phase, the fire-beast resembles a giant, plated worm. The fight against it takes place within a vast lava chamber, the only footholds being dislodged stalactites sunken into the molten rock. Iblis' thrashing periodically dislodges more of the rocky spikes from the ceiling, upon which Sonic or Shadow can make their way towards the mysterious pink orbs at the far end of the arena. 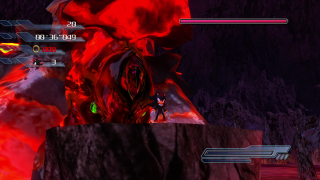 Activating the glowing orbs draws Iblis' attention, and the worm will dive at the appropriate platform to smash the orb - giving the player a brief opportunity to counterattack and hit the beast's central green eye. Iblis supplements his stalactite-raining with various other attacks, including throwing hailstorms of flaming rocks and swimming through lava to smash the footholds to pieces. After the battle, four of the five heroes travel through the gateway back to Soleanna; Shadow remains behind to fight Mephiles Phase 1.